MadgeTech along with Pacific Sensor Technologies is excited to announce the roll out of MadgeTech Cloud Services Basic, a free cloud hosted data logging platform. The cloud is growing in popularity among manufacturers who turn to the platform to help manage product quality and safety. Specializing in measurement and monitoring solutions, Pacific Sensor Technologies is dedicated to helping clients find the most reliable and affordable products to meet their needs. Pacific Sensor Technologies only offers MadgeTech’s state-of-the-art collection of data loggers and accessories, making them the premier distributor in Australia. All MadgeTech wireless data loggers are compatible for use with the MadgeTech Cloud Basic Services, which makes monitoring conditions easier than ever. Now users can now get instant access to real-time data from multiple facilities and locations from any internet enabled device, anywhere in the world. Combined with MadgeTech’s newly released RFC1000 Cloud Relay data logging hub, all data is transmitted directly to the cloud eliminating the need for a computer. Simply plug in the RFC1000 Cloud Relay using an Ethernet cable, and within minutes it can simultaneously receive and transmit recordings from up to 64 data loggers. A popular choice for high temperature monitoring and validation is MadgeTech’s HiTemp140 data logger series. The rugged, stainless steel is built to withstand temperatures up to 140°C (284°F), making it the ideal solution for an array of high temperature applications. With the ability to select from a multitude of probe lengths and styles, this series has quickly become an industry favorite worldwide. Pacific Sensor Technologies also offers an intrinsically safe RHTemp1000IS temperature and humidity data logger to record and validate measurements throughout the EtO sterilization processes. Since the use of Ethylene Oxide for sterilization introduces potentially dangerous risks, the intrinsically safe (IS) rating is required to prevent risk of explosion. The RHTemp1000IS works in conjunction with the MadgeTech Data Logger Software to provide advanced calculations for compliance reports. For nearly a decade MadgeTech and Pacific Sensor Technologies have been working together to incorporate the latest technology into cutting-edge solutions. As the partnership continues, so does our dedication to provide clients with excellent service and the best solutions to meet demands. 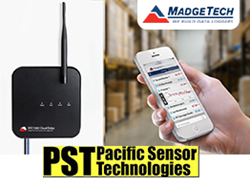 To learn about the entire line of MadgeTech products available in Australia, contact Pacific Sensor Technologies directly.